100% natural and almost 100% organic (silly beeswax labeling rules) but all made with love from us to you! 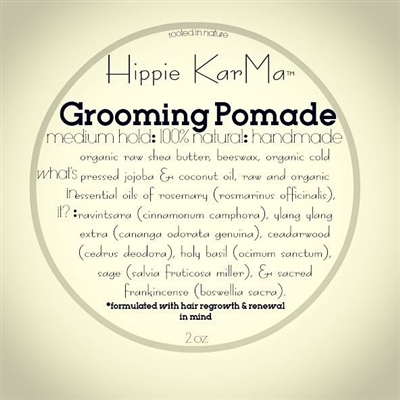 This hair sculpting pomade is made with oils known to regrow and renew all types of hair! It is unisex but has the whiff of rosemary, cedarwood, and sacred frankincense. Inspired by our popular hair oil, we knew we had to make it into a product men (or women!) would love too! We infuse raw shea with raw wild & organic oils then whip in just enough melted wax to emulsify it into the classy classic pomade that all dappers and flappers used to make/use before petroleum became the base for our hair and beauty world. Feel free to use on any and all hair that needs to be groomed and tamed, or tousled! Rosemary oil and rosemary teas are widely used for hair care in shampoos and lotions. Regular use of rosemary oil helps to stimulate follicles, making hair grow longer and stronger. It is also believed that rosemary oil slows down premature hair loss and graying of the hair. Therefore, it is an excellent tonic for balding people or those who are beginning to show signs of pattern baldness. Rosemary essential oil is also beneficial for dry and flaky scalps. Regular massaging of the scalp with rosemary oil nourishes the scalp and removes dandruff. A delicious herby smelling oil that comes from the Cinnamonum camphora tree. Known as a healing oil that is much like eucalyptus but much softer scent. Helps scalp circulation and renewal. Yea it gets me too, just read it as [ee-lahng-ee-lahng] Ylang-ylang is a stimulating, yet relaxing oil with antiseptic and aphrodisiac properties, it elevates the spirit and consoles the heart. It is commonly used to address poor circulation and aid in healing skin irritations. Cedarwood oil was used by all ancient civilizations in medicine, perfume, and cosmetics. Stimulates the scalp and promotes hair growth! Very grounding and soothing. Time and again, Holy Basil has been proved as a wonder herb that promotes both skin and hair health. In fact, this herb is one of the most essential ingredients used in herbal skin and hair care products. The beauty benefits of Holy Basil plant are plenty. It helps in maintaining a healthy skin and shiny hair. This is one of the sacred herbs of Indian women seeking lush locks. Shhh.. it really is a secret. In Europe it has been recognized for its benefits of strengthening the vital center, skin conditions, eczema, acne, hair loss, and dandruff. Both rosemary and sage are beneficial for alopecia. Great for hair conditioning! Sacred Frankincense is highly anti aging and works to repair and regenerate cells – including skin cells! It is also a great antimicrobial and works as a natural preservative. All of oils also make a glorious healing pomade (it is anti-infectious, anti-bacterial, anti-viral, anti-fungal, and antiseptic!) safe enough for switching from extensions/add ons, going natural for the first time in a long time, healing from scalp trauma and last but not least also a barber's hands best friend! NO ALCOHOL or CHEMICALS!